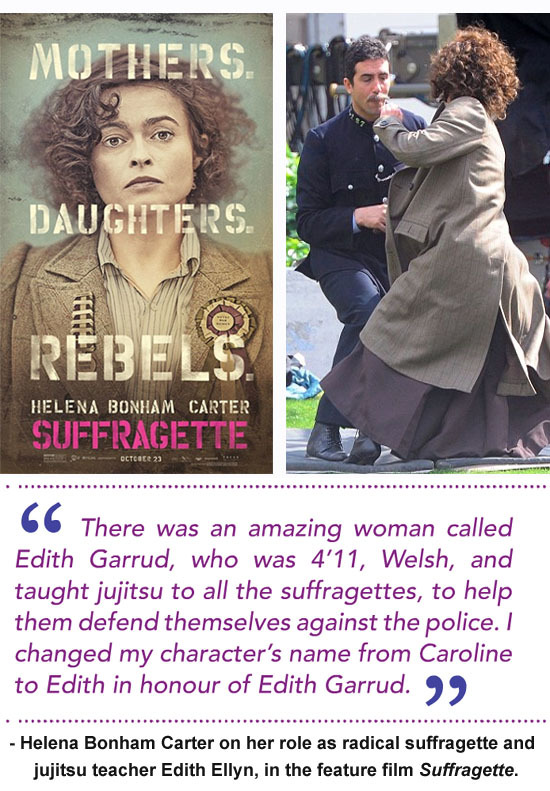 Along with rave reviews for the recent world premiere of Sarah Gavron’s Suffragette feature film comes the surprising news that Helena Bonham Carter’s character was actually named in honor of real-life suffragette jiujitsu instructor Edith Garrud. Edith Garrud makes cameo appearances in the Suffrajitsu graphic novel trilogy and is a supporting character in several of the short stories and novellas inspired by that trilogy. Suffrajitsu was largely inspired by the adventures of the secret society of bodyguards known as the Amazons, who defended suffragette leaders against arrest and assault. Edith Garrud was their chief trainer. Bonham Carter’s movie character, Edith Ellyn – representing the most radical of the suffragette activists – is also portrayed as a jujitsu instructor in the movie, although, as the actress notes, a number of the jiujitsu scenes have been removed for story reasons. Hopefully they may re-appear in some form when the movie is released on DVD. WEISS: Did you feel pressure portraying Edith because she’s a historical figure? BONHAM CARTER: No, it was only tangential to the fact that she was historical. Originally the character I was asked [to play] was somebody called Caroline, and then I found out about this character called Edith [Margaret] Garrud, who was 4’11” and taught the suffragettes jiu-jitsu—basically self-defense—against the police. I based a lot of this character on Edith, but having said that, for story reasons, a lot of the jiu-jitsu has been cut. But no, I didn’t feel pressure, because no one knows about her anyway. She’s a real inspiration and, I thought, an amazing story; this woman who is literally 5’1″ or even 4’11” and could defend herself against these men twice her weight and twice her size. One of the big arguments against women getting the vote, which was such a stupid one, was that they couldn’t fight for their country. They can fight. WEISS: Edith speaks of the need for action rather than words for change to happen, and the fight in this film isn’t a quiet one. Was the filming process intense? BONHAM CARTER: We had riots, obviously not real riots, but we had proper fights. Anne-Marie [Duff] got hurt at one point. If you’re having a riot, and the police are restraining you, and you say “Stop,” the stunt men didn’t realize she was saying stop as an actress. So it ended up being quite complicated at first, but then luckily she wasn’t really badly hurt. It was extraordinary, actually, being in the middle, as I’ve certainly never experienced any physical violence. I learned lots of jiu-jitsu, too, so that was fun. So it wasn’t peaceful, it was extraordinary. WEISS: I actually grew up doing jiu-jitsu. BONHAM CARTER: Did you enjoy it? WEISS: I loved it. I liked that you could be small, and it’s about using the right moves to find your power, versus brute strength. BONHAM CARTER: That’s exactly the method that I wanted to get across. That’s what I thought was so potent for Edith: it wasn’t about brute force; it was about skill. Women can hold their own against men.